Mick Douglas & Sam Trubridge, ‘Current Practices‘, Performance Research (‘On / At Sea’ issue), vol 21: issue 2, 2016, pp96-107. Mick Douglas, ‘Carriage notes’, Performance Research (‘On Rupture’ issue edited by Peter Eckersall and Helena Grehan), vol 16: issue 6, 2014, pp46-53. Mick Douglas & Rochus Urban Hinkel, ‘Atmospheres and occasions of informal urban practice’, Architectural Theory Review, Vol. 16, issue 3, 2011, p259-277. Mick Douglas, ‘Actively social’, in Dodd, M. et al (ed’s.) Live Projects: designing with people, Melbourne: RMIT University Press, 2011. Mick Douglas, ‘Situating social contingency: mobility and socially-engaged public art’, in Hinkel, Rochus (ed), Urban Interior: informal explorations, interventions and occupations, Baunach Germany: Spurbuchverlag, 2011, pp. 45-62. 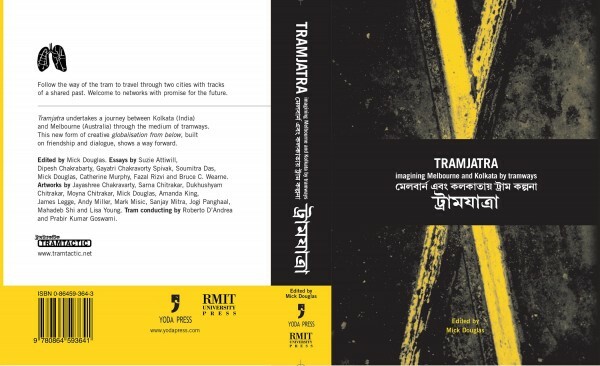 Mick Douglas, ‘Tracing Tramjatra: Toward a Participatory Aesthetic Politics’, in Narayan Bandyopadhyay, Debasish & Browne, Paul (eds) Landscape, Place and Culture: Linkages between Australia and India, Delhi: Cambridge Scholars Press, 2011, pp. 176-197. Mick Douglas, ‘Cultural Transports at Play’, in Rainbird, Sarah (ed) Harmonic Tremors: Aesthetic Interventions in the Public Sphere, Melbourne: Gasworks Arts Park, 2009: p45-51. Mick Douglas, ‘Forward’, in Mick Douglas (ed) tramjatra: imagining Melbourne & Kolkata by tramways, Delhi: Yoda Press and Melbourne: RMIT University Press, 2005: p2-11. Mick Douglas, ‘Invention Intervention’, in Mick Douglas (ed) Invention Intervention, Melbourne: RMIT University Press, 2004: p5-13. Mick Douglas, ‘Other Ways With Wheels’, Thinking on Two Wheels Cycling Conference proceedings 2007, University of South Australia. Mick Douglas, ‘Imagining transports of sustainability’, International Journal of the Humanities, Vol. 1, 2003, article HC03-0104-2003. Mick Douglas, ‘Tracking a tram-way of knowing: Poetic search & speculative design’, Design plus Research: Proceedings of the Politechnico di Milano Conference May 1 –20 2000, Eds. S. Pizzocaro, A. Arruda, D. De Moraes, Politechnico di Milano, p. 139-145. Mick Douglas, ‘Performance Code for a Tracking Vehicle’, Dialogue No. 12 ‘Civic’, August 1999, p. 100-103. Mick Douglas, Bree Hadley, Meredith Rogers, (eds), Transported: Australiasian Drama Studies 69, 2016. Mick Douglas (ed), ‘Invention Intervention’, Melbourne: RMIT University Press, 2004: p5-13. ‘The Museum of Modern Oddities is Open’ introduction in Katy Bowman & Neil Thomas The Museum of Modern Oddities, Axolyte Press, Melbourne 2001. ‘Manufacturing Freedom & The Return to Nature’, Transition 44/45 1994, p144 -149. ‘The Product of Music’, The Interior, Vol 1, No 3, 1992. ‘Get the Picture’ catalogue text for exhibition ‘Infotainment’, Brett Jones & Sarah Stubbs, Centre for Contemporary Photography, Melbourne 1995. Fiona Wilkie, ‘site-specific performance and the mobility turn’, Contemporary Theatre Review, Vol. 22, No. 2 (May 2012), pp203-212. Melbourne Meets Karachi, Australia: Intersections of Identity – Resources for English (curriculum resource initiative for Australian secondary schools engagement with Asia), Asian Education Foundation, 2010. Stephen Muecke, “Momentum” in Cultural Theory in Everyday Practice, Edited by Nicole Anderson & Katrina Schlunke, Melbourne: Oxford University Press, 2008, pp 287-295. Fiona Capp, ‘tramjatra review’ The Age, Saturday 29 April 2006, p25. Suzie Attiwill, ‘Ride-On-Dinner’, Artichoke 27, 2009, p66-67.